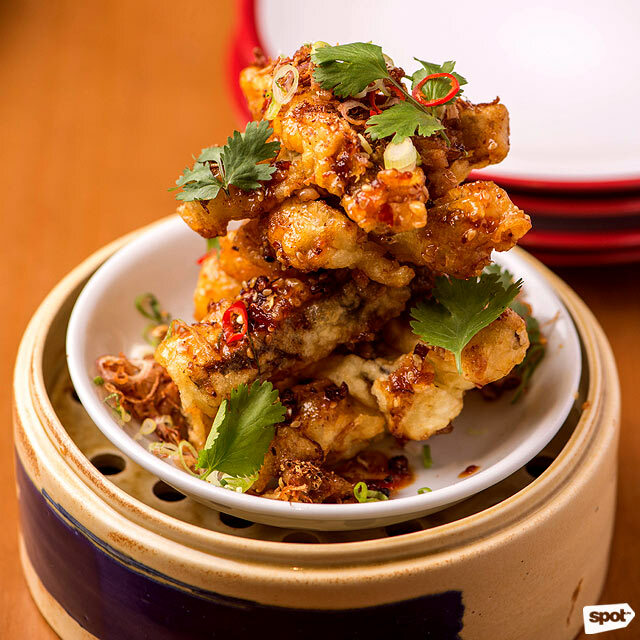 (SPOT.ph) Deep-fried food may not be everyday food, but the addictive combo of texture and flavor can be pretty hard to refuse. Whether it's coated in a beautiful crispy batter or fried in all its naked glory, we have to admit that there are days when nothing can beat the comforting familiarity of fried goodness. 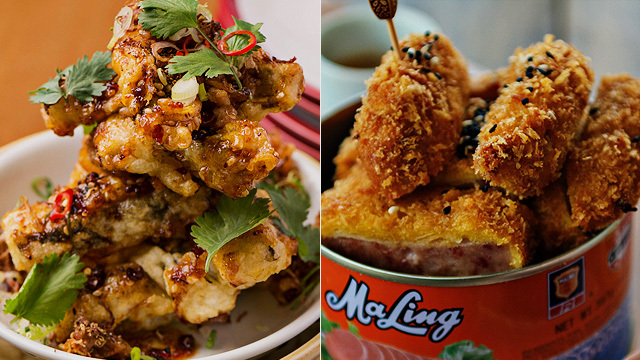 We round up 10 of the best fried dishes to try when you just can't give a damn about your diet anymore. Hey, you only live once! Never underestimate the power of the appetizer. Apart from their ramen bowls, people also go to this low-key Japanese restaurant for their best-selling Curry Cheese Rolls. 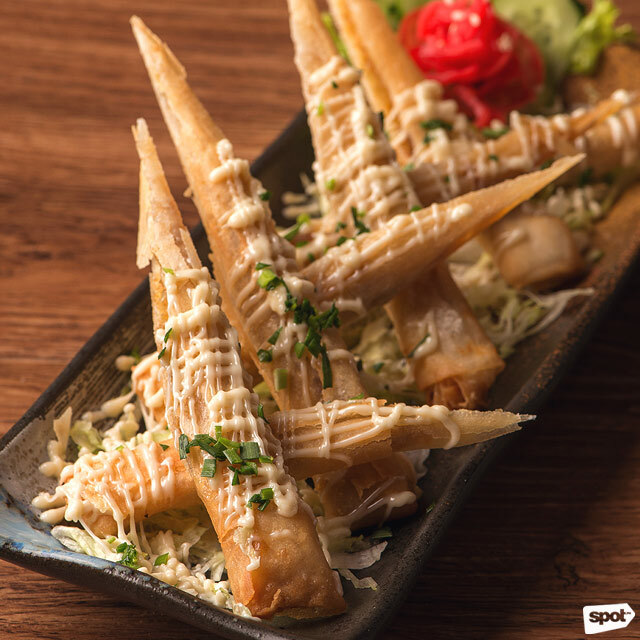 This cheese-laden starter seems like an average spring roll from afar, but grab a bite and you’ll know from the taste alone that it’s not your ordinary lumpia. With a wonton wrapper cooked to a perfect crunch, the dish also flaunts a curry-spiced cheese and drizzles of zesty Japanese mayonnaise. Ramen Shokudo is at 401 Banawe Street, Sta. Mesa Heights, Quezon City. This dish has a curious name, but after trying Bodega Kitchen & Bar’s Jogging Bukas, you’ll understand the reason behind the moniker. It's everything that will make you want to feel a sudden need to work out. 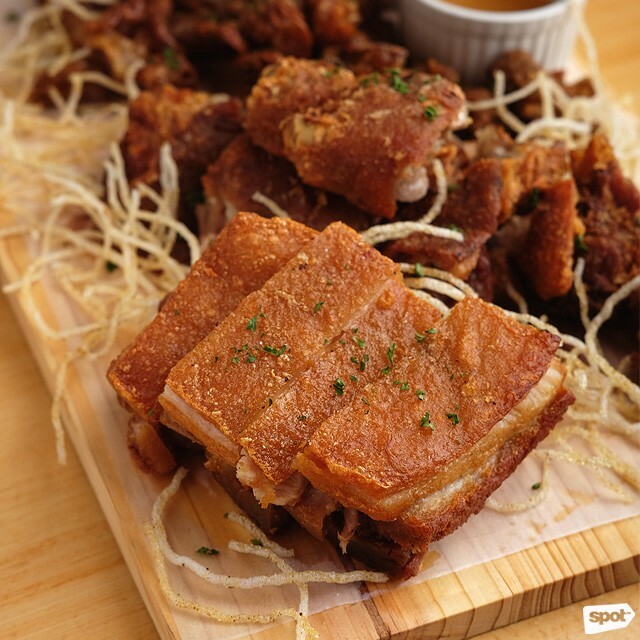 One order will get you an assorted platter of pure, crackling self-indulgence—bagnet, crispy pata, and chicharon bulaklak. Need we say more? Besides an extensive booze collection (not to mention its ace barbershop services), The Thirsty Barber at Greenhills is also known for their excellent bar chow. Created by Chef JR Royol of Masterchef Philippines, the menu specializes in Filipino cuisine with a creative take. 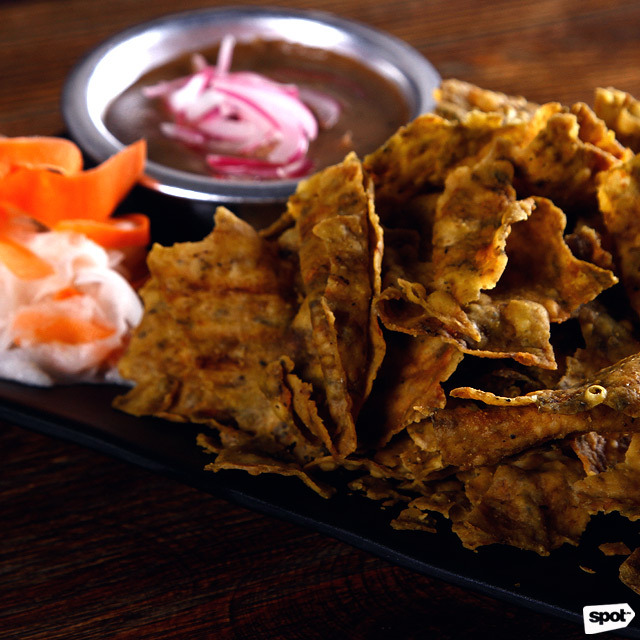 Their deep-fried Mussel Chips are served with a Kilawing Talong Dip, a marriage of salty, tart, and creamy flavors that pairs perfectly with a bottle of beer. The Thirsty Barber is at G/F Promenade Mall, Wilson corner P. Guevarra Street, Addition Hills, San Juan City. Inspired by Binondo, Ping Pong Diplomacy boasts an innovative Chinese-American menu that veers away from the familiar Cantonese fare many Filipinos have grown up eating. However, the dishes are no less comforting despite their novel tastes. 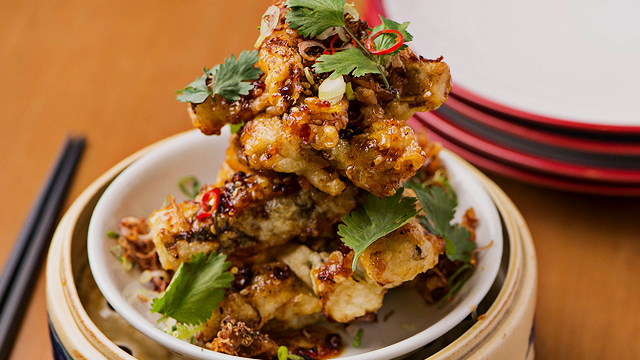 The Crispy Eggplant with Fragrant Sauce is an interesting blend of flavors, where deep-fried eggplant slices make for a mild base of a sweet and spicy glaze. Have it as is or with Ping Pong Diplomacy’s Dan Dan Chicken Skin Rice—either way, you’ll find yourself licking the plate clean in no time. Joining the repertoire of American barbecue restaurants in Makati is The Smoking Joint. But besides their no-fail ribs and wings, we think the Jalapeño Poppers also deserve your attention. 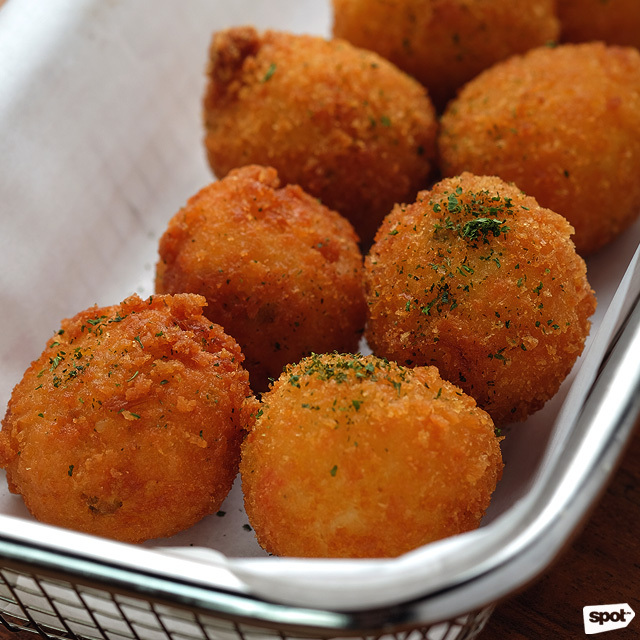 In place of potatoes like true-blue tater tots, this deep-fried appetizer uses rice! It works, nonetheless, and it will remind you of arancini or stuffed rice balls. Their orders are good for sharing so bring your friends! The Smoking Joint is at Green Sun Hotel, 2285 Chino Roces Avenue, Makati City. Prepare to drop your jaws once Providore Backyard’s Beer Battered Seafood “Cocktail” Platter arrives on your table. 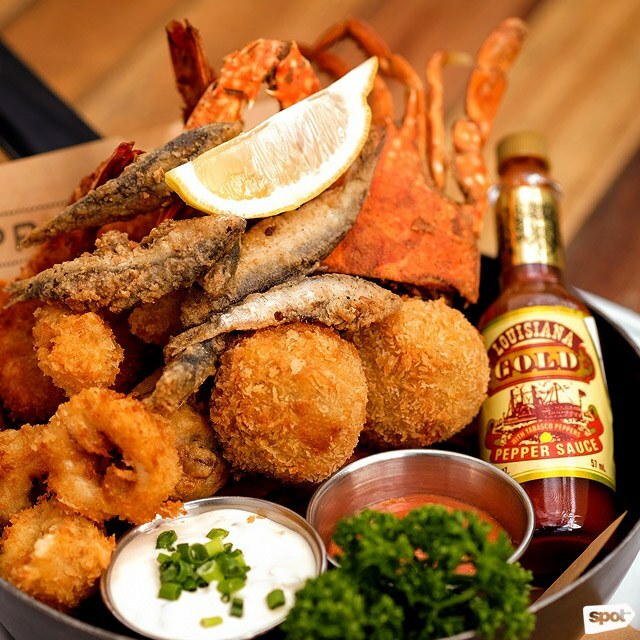 One order will get you an assortment of crispy seafood munchies including calamari, blue swimmer crab, mozzarella-stuffed shrimp, and various beer-battered fish nibbles. Feel like you’re on vacation by the beach and sample their refreshing cocktails while devouring this fishy masterpiece. Providore Backyard is at G/F SM Aura Premier, Bonifacio Global City. This speakeasy hidden inside a convenience store in Bonifacio Global City is a haven for people who want to get away from the boisterous party crowd. It can also be your go-to pub if you want delicious bar bites to go with your handcrafted cocktail. 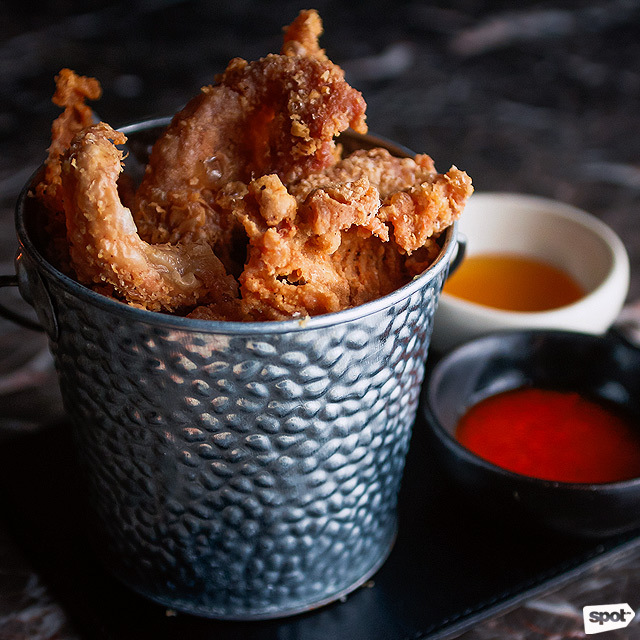 Their Chicken Skin Chicharon is a standout with its highly addictive crunch that’s sinful to the very last bite. Bank Bar is at G/F RCBC Savings Corporate Center, 26th Street, Bonifacio Global City. This lively little nook in Uptown Mall will fulfill your deep-fried fantasies. 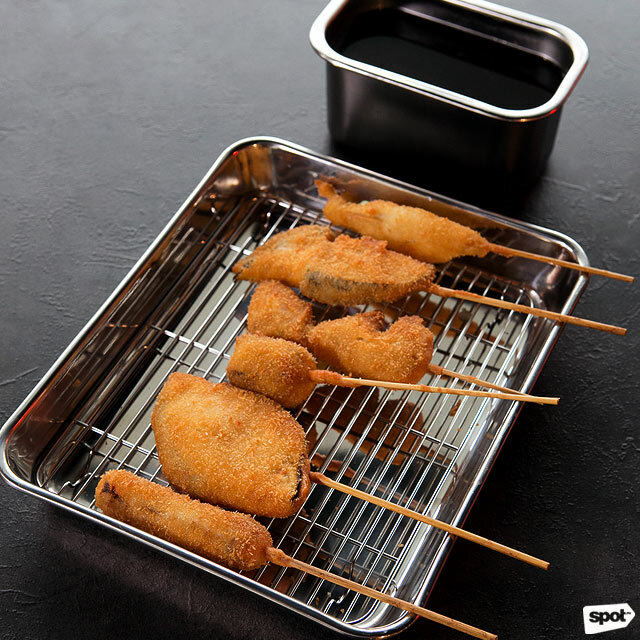 At Kushikatsu Daruma, over 80% of their menu is cooked in extremely hot oil. It’s definitely a good thing if you’re a fan of all things breaded and covered in golden, crunchy batter! Try the crowd-favorite beef kushikatsu for a tender and succulent mouthful. Before you forget: No double-dipping! 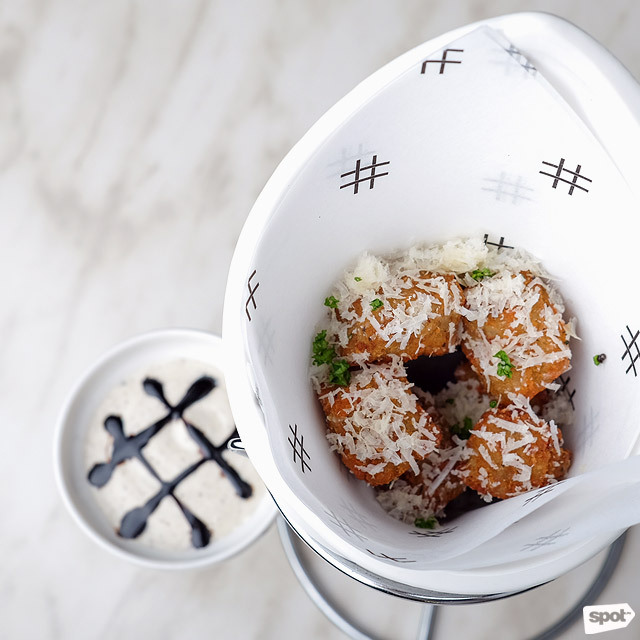 Burgers aren’t the only noteworthy dishes on Pound by Todd English’s menu—their Truffle Risotto Tater Tots will also keep you coming back. Garnished with fresh parmesan shavings, these little rice fritters are laced with a distinct truffle taste that mixes well with the savory risotto inside. Dip it in their signature silky mayonnaise sauce for that extra oomph. 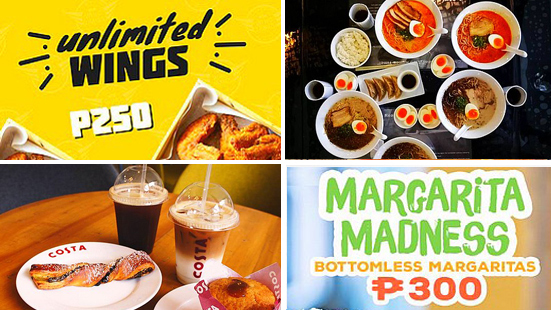 Pound by Todd English has branches at Bonifacio High Streert, Bonifacio Global City; SM Megamall, Mandaluyong City; Robinsons Place Manila, Ermita; and Eastwood Mall, Libis, Quezon City. If you happen to find yourself in Kapitolyo, don’t miss out on Yuan Bistro’s bestseller, the X.O. Tonkatsu MaLing Fries. 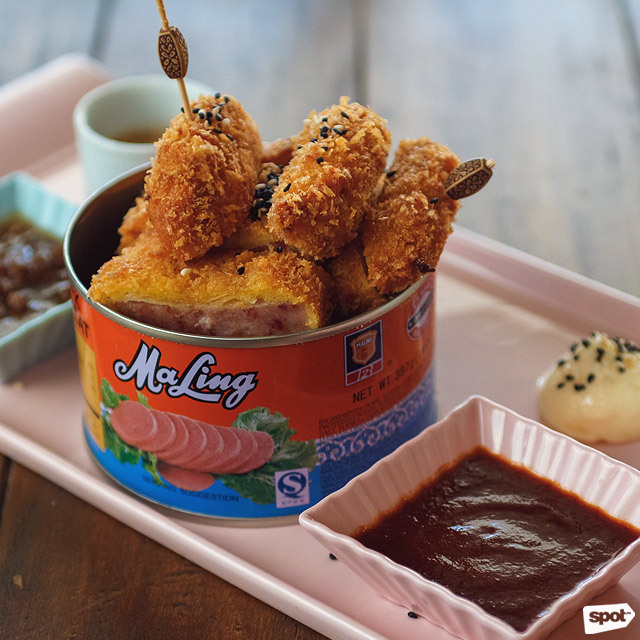 Served in an empty MaLing container, this deep-fried snack is downright photogenic. But aside from its aesthetic, the taste is likewise a winner in our books. The all-time favorite luncheon meat is coated in a light panko batter and served with a sweet-savory X.O. sauce for dipping. We’re sure it’ll be gone before you know it! Yuan Bistro is at Unit 4 Victoria Brixton Plaza, 1 Brixton Street, Kapitolyo, Pasig City. 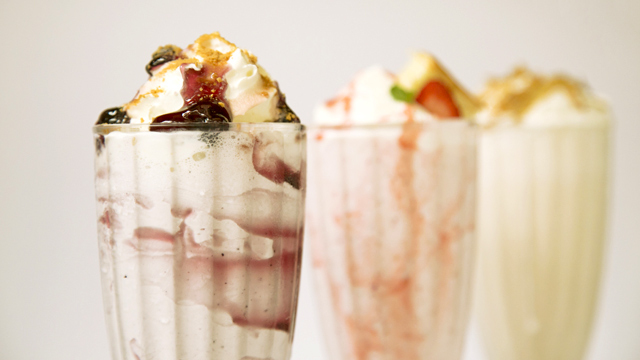 Guess who just turned blueberry cheesecake into a milkshake!